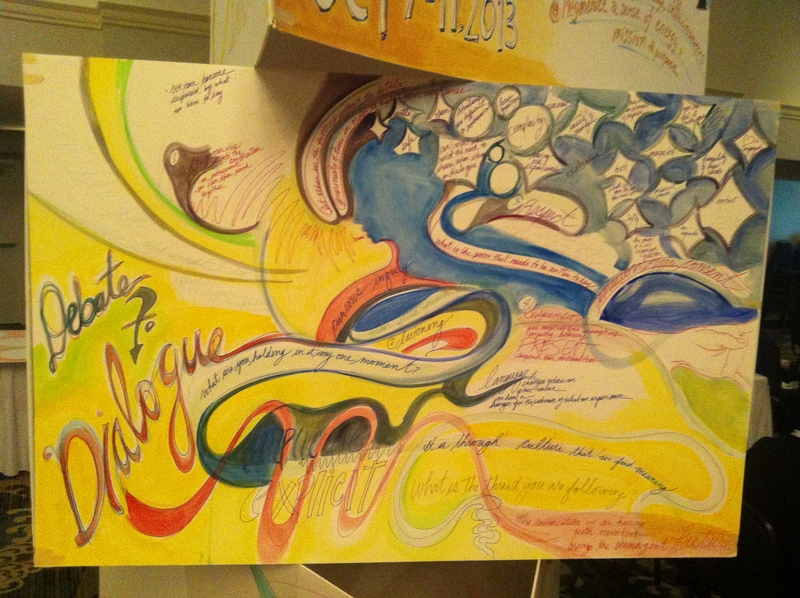 Reflecting on Tamarack’s 2013 Communities Collaborating Institute – Anticipate! How does one feel exhausted and energized at the same time? Well, attend a Tamarack CCI and you will understand that sentiment! Accelerating Impact was this year’s theme and rally cry, and it prompted some excellent conversation at the Learning Pod I facilitated. When asked what accelerating impact meant to him, one of our pod colleagues, Tom, said, “For me it means slowing down.” We all discussed that apparent contradiction and the result of our exchanges was realizing that there were a number of factors that were critical to accelerating impact. One of the key factors is: working together in a focused way, which may actually mean slowing down some other initiatives to get at what we all believe is most important. Another interpretation of “slowing down to accelerate impact” is that too often community organizations and groups expend too much effort on our own when we might be better off joining forces to focus our resources on a common aim. Tom’s response to the question is an example of what I have been writing about on my blog, which is Upside Down Thinking. You can read more about UDT at in the posting before this one (or here) if you are curious, but the gist is that sometimes we need to turn something on its head and think about opposites and what truths we might find in doing so. Tamarack’s CCI allows us the space to do that. I have been to three CCIs and this one was the best one I have been to, and that’s not because it was held in my hometown! As is true at any conference, some things impressed me more than others. In addition to my excellent pod experience (big thanks to all my pod colleagues), I was so thankful for the time given to Adam Kahane’s work. He spoke to all of us in plenary for two mornings and held two workshops, which allowed us to truly engage with him about Transformative Scenario Planning (TSP) and his Change Lab Technique. Adam is a deep thinker with an uncanny ability to speak clearly about his subject matter and in ways that allow for what I will call “robust accessibility” of his concepts. I found it more than interesting that, while all of us understand that the problems we face together are complex and not able to be reduce to simple recipe solutions, Adam was able to identify, for example, five conditions for TSP which also, he said, were the conditions for a successful change lab (or social lab which is another term he used). We learned that TSP was about exploring what is possible, not necessarily what should happen and that this form of planning ought be viewed as an adaptive tool we can deploy to explore the creation of new futures, new realities. We were reminded that to truly explore possibilities we had to help one another “suspend certainty.” I believe we all know or intuit this, but the importance of such “suspending” was well explained in Adam’s delivery. That said, Adam’s five conditions further clarified if and how and when Transformative Scenario Planning or Change Labs could work. Here are the five conditions I scrawled out on my note pad. I beg Adam’s forgiveness if my notes fall short of a rich summary. Key actors must believe they need to collaborate, that they can’t get to transformation unilaterally. If this first condition is not met, I inferred from Adam’s explanation that it might be better to wait than forge ahead with an incomplete cast of participants. The participants must represent the whole system, albeit in microcosm, meaning all of the social, economic, political, and cultural actors must be willing and full participants. The space in which the participants work must be neutral and offer a safe place to dialogue and try things out. This suggests to me there must be authentic openness to one another and a mutual commitment to building trust. The talking and the listening must enact new futures or possibilities of new realities, which means to me that what transpires for us together must somehow point to and eventually result in big change actions, not small incremental tweaks. The entire undertaking must qualify as an instructive, constructive, and transformative process. This means what we are doing together is more than having conversations or debates or positional posturing. The process must serve simultaneously as a framework that guides us and as a liberating influence. I could go on, but I suggest you Google “Adam Kahane” and take a look at the three books he has written. My favorite is Power and Love: A theory and practice of social change. If you are curious have a look-see at this YouTube video. King’s words are profound and speak to the need for both power and love to work together – not just “in balance” which Adam says is not possible– within our individual and collective being to effect change and justice in the world. I won’t say anything much more here but I encourage you to read this important book because it reminds us that ultimately the work we do must recognize the place of power in the changes we wish or need to make but also that at the foundation of our work is love, something we often do not typically talk about, much less embrace fully. Tom Kelly’s session on Theory of Change prompted the widest range of reaction in my pod. Some felt that crafting a theory of change should be fundamental to our work and serve as a key element, if not the umbrella statement, of our visions and strategies. Others felt what was presented over complicated a rather simple concept or tool we should deploy when it makes sense to do so. And of course there was a range of reactions in between. I mention this not to motivate a resolution to the range of responses, but rather to underscore the importance and vitality of a pod experience that allows people from all walks of life and work to authentically engage one another, listen to various perspectives, and work diligently to understand one another. The result for me was learning from those whose reactions were disparate from mine and influencing my own perspective. I believe this happened to all of us. This is one of the aspects of Tamarack’s CCI that I truly celebrate: exposure to the bright minds and good will of my colleagues as we collectively seek meaning of ideas, concepts, and possibilities that will help each of us become more than we were when we arrived. There is of course many, many things that took place at the gathering that I am not writing about here. Hopefully others will cover some ground I have not here, but I want to add one or two more things I wish to share. First, I am so grateful for the inclusion of music and art in the proceedings, namely the wonderful, uplifting music of Michael Jones (not to mention his stories and his views on leadership) and the visual documentation of the proceedings created each day by Elayne Greeley (see image). Add to this the incredible drummers (Aboriginal, African, and Japanese) we witnessed at the Thursday night party and the richness of creativity experienced at the 2013 CCI surpasses anything I have experienced at other conferences or gatherings. Truly inspiring. Personally, I was granted the opportunity to share my own songwriting/music at the conference and it prompted me to write a song specifically for the conference, called the “The Truth We Find in All that We Deny.” This was the first time in ages I performed publicly, having set aside my music for years, for far too long. The opportunity rejuvenated not only that expression of my creativity but also the desire to re-embrace it in my work and life. This was truly a moving experience for me. And that was enough for me to be honest. Then Paul Born asked me to sing the song again as the conference closing. Wow. I want to, I need to, say thank you for such affirmation. It truly meant and means the world to me. Second, I have to send many thanks to all of the staff who organized, coordinated, and made adjustments throughout the conference. Clearly everyone of Tamarack’s staff were focused on doing whatever they could to enrich our collective experience. Thank you Tamarack and all who spoke and all who attended and shared and learned and taught. As my friend Paul Born says often, “Much Joy”… to all of you.